Fred Lepkin is a Canadian historian and an avid genealogist on the quest to uncover his family history. How I got in contact with Fred? Well, a relative of him was performing some online research and ends up at my website, to be more specific, at my article on a Travel Document with a Sugihara visa. Fred contacted me then by email asking for more details. I sent him all the data and pictures I had from this document. And what a surprise to learn that Fred was soon coming to Bangkok on vacation and so we arranged to meet. The meeting took place at the sky lounge of the Sofitel hotel in Bangkok. Fred told me with passion all details about his family tree and showed me some more pictures and documents from Benno and Bertra. Benno & Bertha Lapidus (to whom the travel document was issued) were siblings. Fred inherited in 1988 a small studio apartment in Paris from his great aunt, Marie Scher, nee Lapidus (Marie was the sister of Benno, Bertha and Elizabeth). His family hailed from Bialystok, Poland after WWII. Fred found then among Marie’s papers documents and correspondence showing ongoing efforts to reclaim parent’s Polish property, etc. Bertha and Benno got saved by righteous diplomat Shinue Sugihara who issued a life-saving visa for them to escape from the Nazis and the Holocaust. Full details about this document can be found in my article “Altered Sugihara Travel Document To Save Not One Jewish Life But Two”. 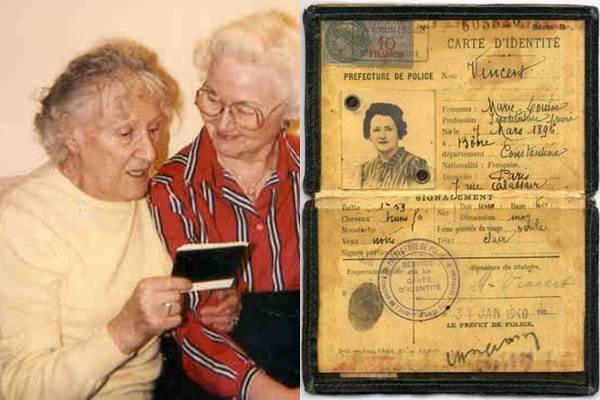 Also Marie Scher (nee Lapidus) and her husband Arkady were saved during the German occupation in Paris till liberation by a true friend – at tremendous risk – not only for hiding them, but also for transferring her identity to Marie. The act of hiding Marie and Arkady as well as transferring her identity to Marie, would, had she been caught, resulted in a certain death penalty. The lady on the left is Mme. Vincent. She transferred her own identity to Marie Scher, the sister of Benno Lapidus. (Fred’s mother on the right) to save her life during NS German occupied Paris. The picture is from 1988, both are now deceased. Fred mentioned he was able three years ago to register a claim for the property with a new claims organization. They sent him a claim number but nothing has transpired since. But again by random he met in Bangkok a Polish lawyer specialized on such cases. Let’s hope Fred’s curious case will end up in peace and harmony. It’s not the first time I was part of such amazing and unusual life stories and all this to my rather unusual hobby and website. Fred, it was a great pleasure having met you and I thank you for sharing your family story with me.